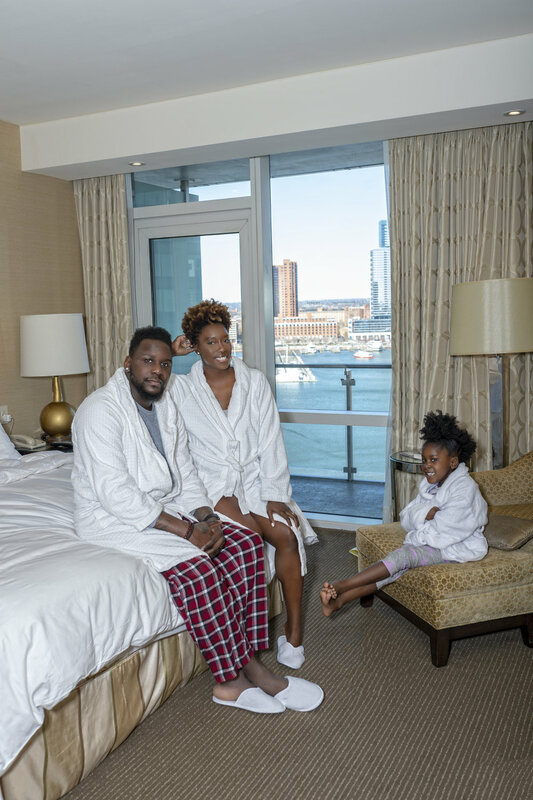 We are coming off of a fantastic family staycation at the Four Seasons Hotel Baltimore, and I am feeling so relaxed and recharged. The Four Seasons Baltimore invited us to spend one night and two days at their beautiful hotel, and we couldn’t be happier with our fantastic stay! 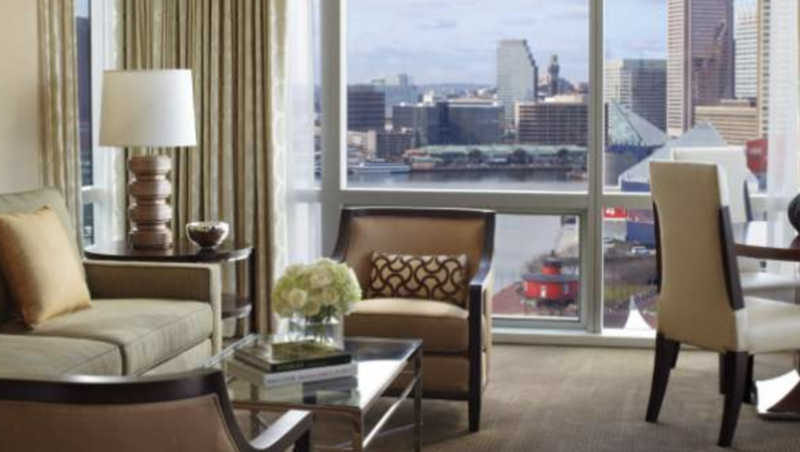 The Four Seasons Hotel Baltimore is a lovely five-star hotel located right in the heart of Baltimore’s Inner Harbor. The hotel is complete with all of the beautiful amenities you would need to have a pleasant family stay. We had the pleasure of having the Family Getaway package which included overnight valet parking, a welcome gift for Aria, family friendly in-room amenities, and unlimited children’s movies. Upon checking into the hotel, we were greeted by the friendly staff and they didn’t come empty handed! They pulled up with a large wagon full of stuffed animal toys for Aria to choose from! She loved this and was immediately excited about our stay. We walked into our beautiful room and was surprised by the amazingly detailed snacks, a note from the staff and a kids camping tent. Aria was surely in heaven with this tent. She couldn’t stop talking about it, and she played in it all night! The attention to detail with the snacks was so thoughtful, and we loved every minute. The hotel room was one of the best we have visited. Our room had a full living room area that overlooked the inner harbor. There was a separate master bedroom with beautiful views too! The master bathroom was incredible with a deep tub, nice shower and double vanity with a TV in the mirror! Every detail of this bathroom is now what I want in my future home...ha-ha. After relaxing for a little bit in our room, it was time for dinner. We were treated to dinner at Italian Disco, which was a short 5-minute walk from the hotel. The food at Italian Disco was great, and kid friendly! After dinner, we went back to our room and relaxed for the rest of the night! Overall, it was an amazing first day at the Four Seasons Hotel Baltimore. The next day, we woke up and ordered in-room dining! The service was excellent, the breakfast came within 30 minutes. We had a family breakfast in the dining room area of the room. Ernest and I had our favorite, shrimp and grits, and Aria had the kids pancakes. After breakfast, Aria had to go to school. She was a little bummed because she wanted to stay in the room all day, but school comes first. Her time at school allowed for Ernest and I to have some alone time. We had a fantastic spa experience in their couples suite. We both had the 50-minute full body massage, and it was INCREDIBLE — the most relaxing I have experienced. I had the mom-to-be massage, which was perfect for me. After our 50-minute massage, we hung out in the couples suite for an additional 30 minutes. They had an incredible jacuzzi tub, and a sauna shower that is a must experience; every part of this day was so relaxing. I am so thankful for the Four Seasons Hotel Baltimore for this incredible family staycation. This was a much-needed getaway for our family, and I am now hooked on the Four Seasons experience. I can’t wait to go back in the summer and enjoy their rooftop pool. 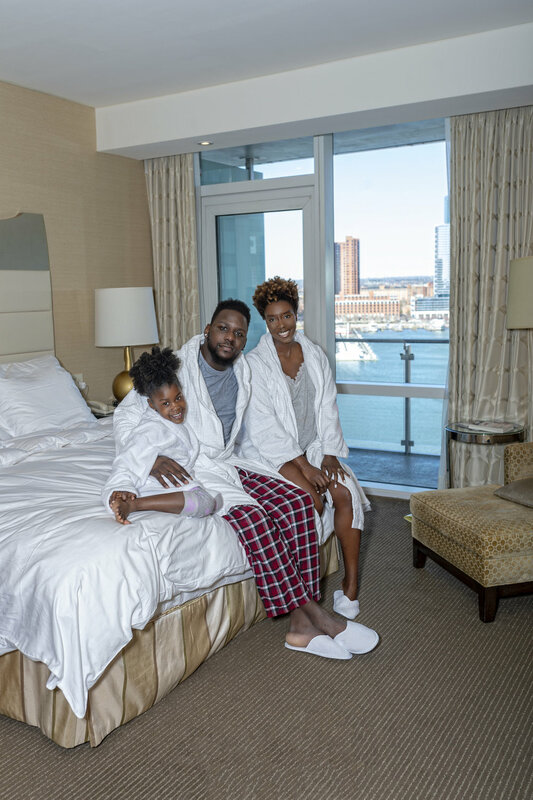 Whether you’re in the Baltimore area and need a little getaway for you and the family or traveling to the area, The Four Seasons Baltimore is the place to go. They will undoubtedly take care of you. Thank you Four Seasons Baltimore for the experience!